15 May SF’s Hottest Neighborhoods! I hope all you mommies had a great Mother’s Day. This was one of the first Mother’s Days that I remember being relaxed and with the kids. Over the past few years I have either been working an open house or the times I did stay home, due to the age of my kids, it was anything but relaxing. 🙂 So this was a nice change. I am trying my best to set better boundaries and take time out to celebrate and spend time with those I love. 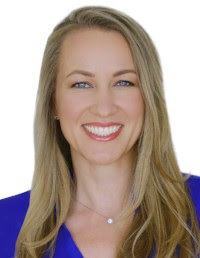 On the real estate front, we have a data-packed newsletter for you, as always. Particularly of interest is the percentage of appreciation in the different neighborhoods. 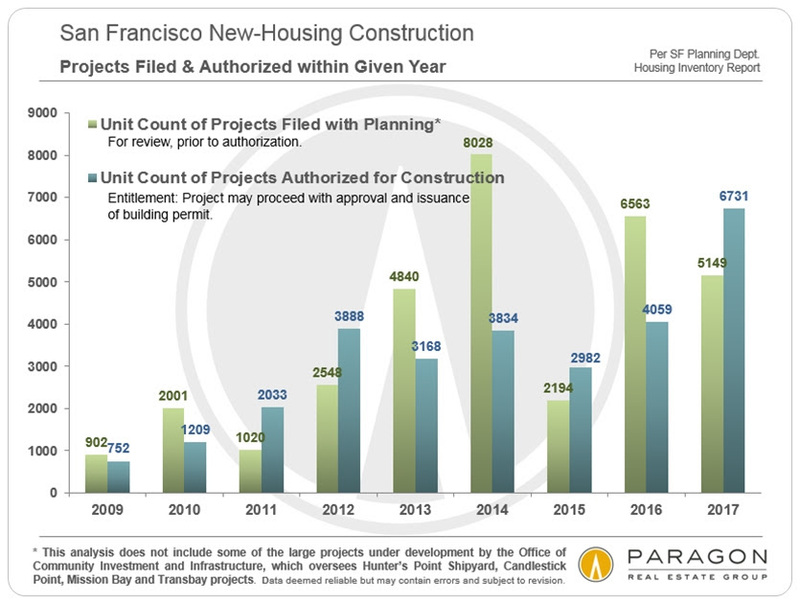 Bayview tops the list at over 18% per year for a single-family home – that’s a 174% increase over just 6 years! The Mission was just under 15% per year (a 128% increase over 6 years). The continued lack of inventory is forcing buyers to look in different neighborhoods and pay higher prices than they expected. On the flip side, it’s a good time for sellers. We’ve been selling homes like hotcakes this year. THANK YOU for all the continued referrals. We’ve been fortunate enough to sell almost a home a week in 2018. In fact, we’ve increased staff by two people to provide the best customer service possible. From what we are seeing, homes under $2M are setting huge records. Our sellers couldn’t be happier, and buyers couldn’t be more frustrated. The current comps make no sense because the market shift has been so dramatic. 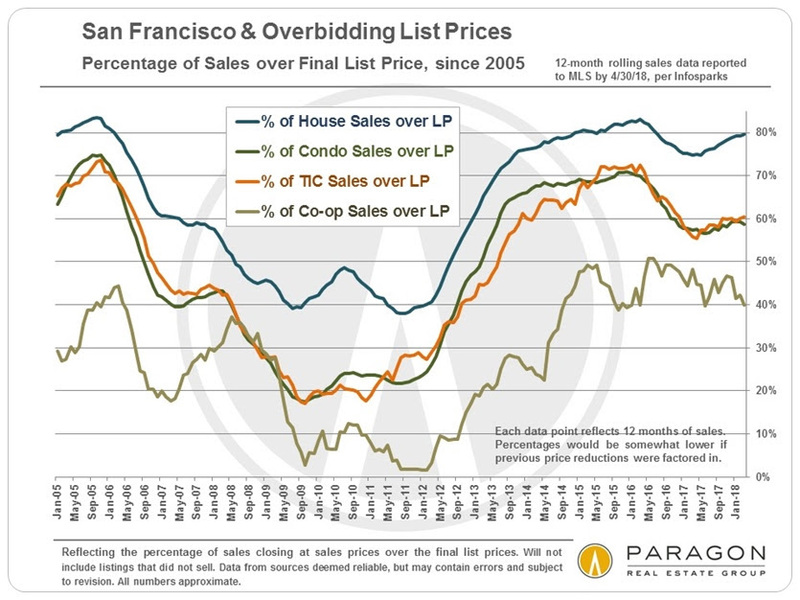 We’ve managed to get some buyers into contract in higher price-point condos, often under list price; the homes between $2-6M are still moving up in price, but not at the same rate as the sub -$2M. 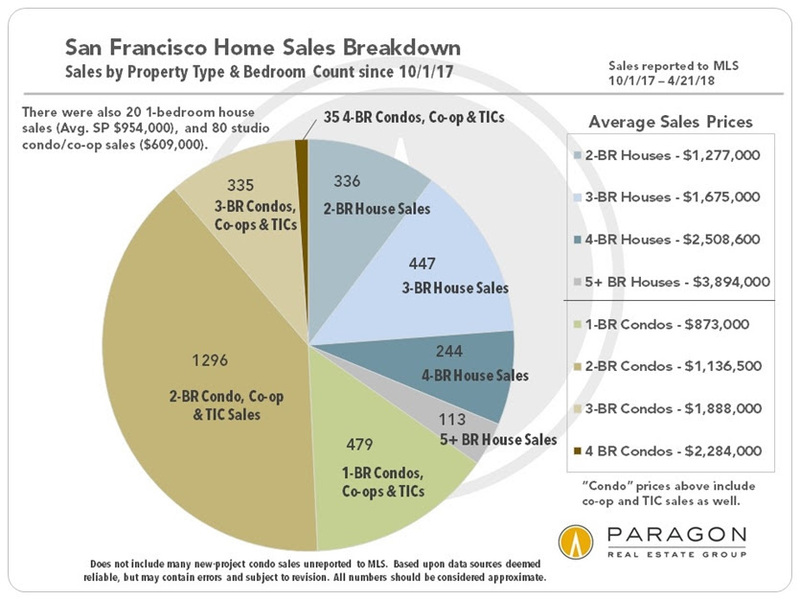 Citywide Home Values & TrendsOn a 3-month-rolling basis, median home sales prices in San Francisco yet again hit new highs in April 2018: The median house sales price jumped $55,000 over the March price to hit $1,665,000, and the median condo sales price jumped $50,000 in April to $1,225,000 (3-month rolling sales through 4/30/18, reported by May 2). Those reflect year-over-year increases of 23% and 8% respectively. 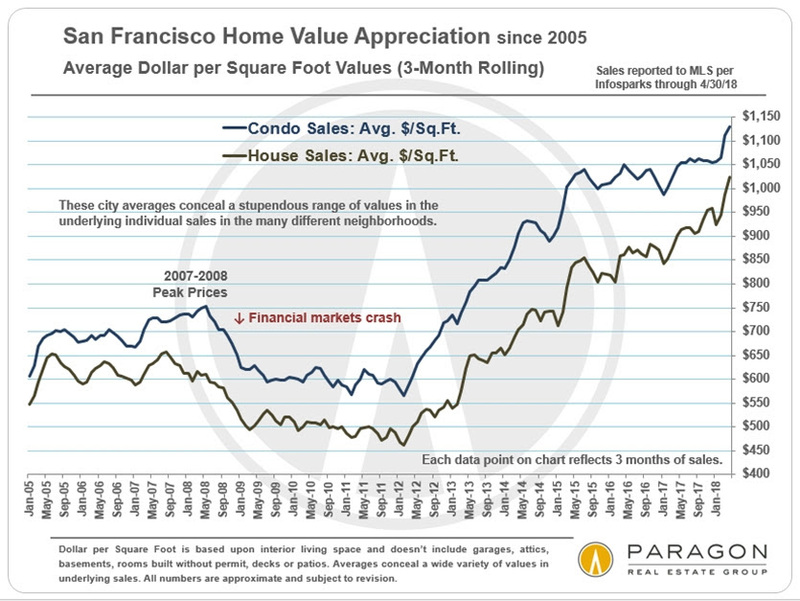 Average dollar per square foot values also reached new peak values. 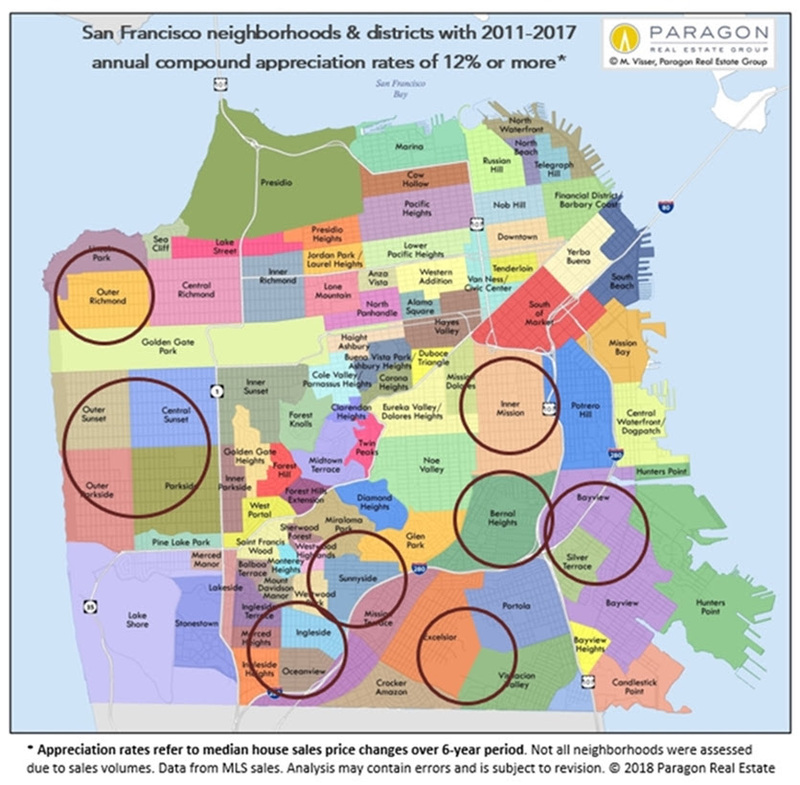 Compound Annual Appreciation Percentages, 2011 – 2017The neighborhoods and districts circled on the map below have seen compound annual appreciation rates of 12% or more over the past 6 years. As a point of comparison, the national rate over that period was about 7%, and the CPI inflation rate about 1.5%. 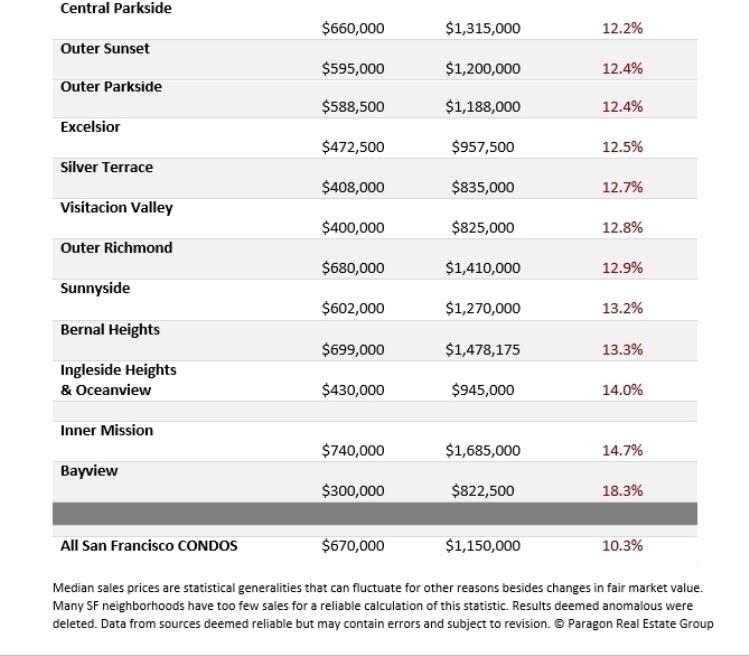 As illustrated in the table below the map, the highest rate in San Francisco over the period was above 18%. If the return on cash investment was calculated for purchasing with a 20% down payment (instead of paying all cash), and adjusting for closing costs (estimated at 2% on buy-side, 7% on sell side), the compound annual rate of return on the cash investment soars: A 10% annual rate of home price appreciation would then translate into an annual compound return on cash investment of just under 40%. The use of financing in homeownership is one of the reasons why it can often be such a good investment to develop household wealth over time. 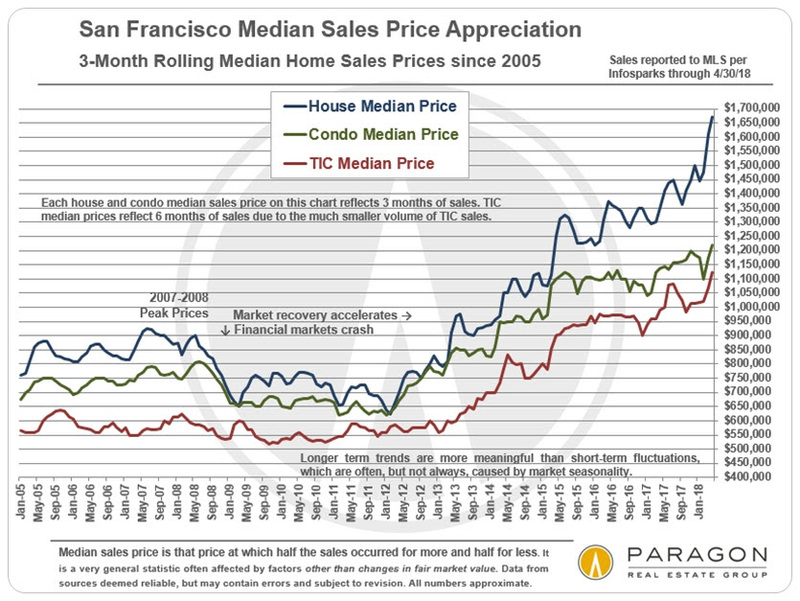 median house sales price by the 2011 price.Though median home price appreciation rates throughout the city have been incredibly high by any reasonable measure, some neighborhoods have outpaced the norm. 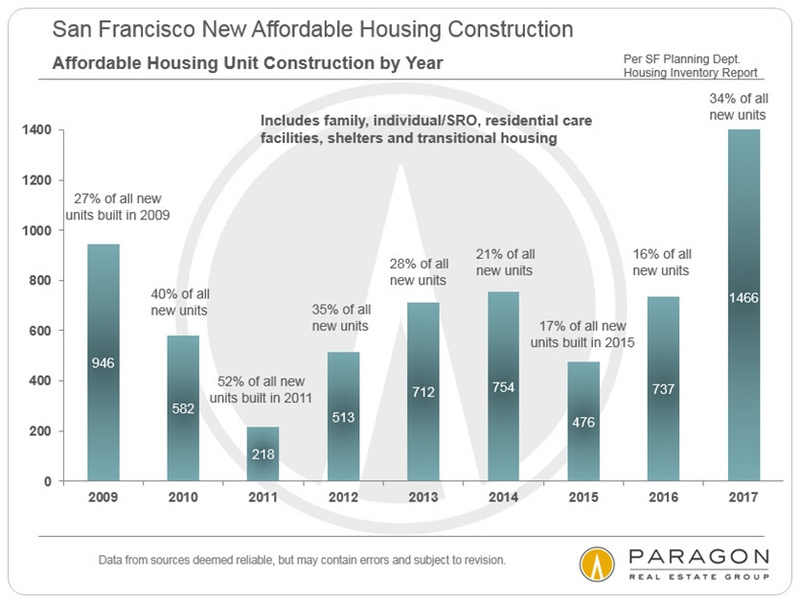 The main reason is affordability: Less expensive homes have appreciated considerably faster than more expensive homes. Also, some of the most affordable districts were hammered by foreclosure sales after the 2008 crash, which brought their sales prices down to unnatural lows by 2011 – setting the stage for dramatic recoveries. 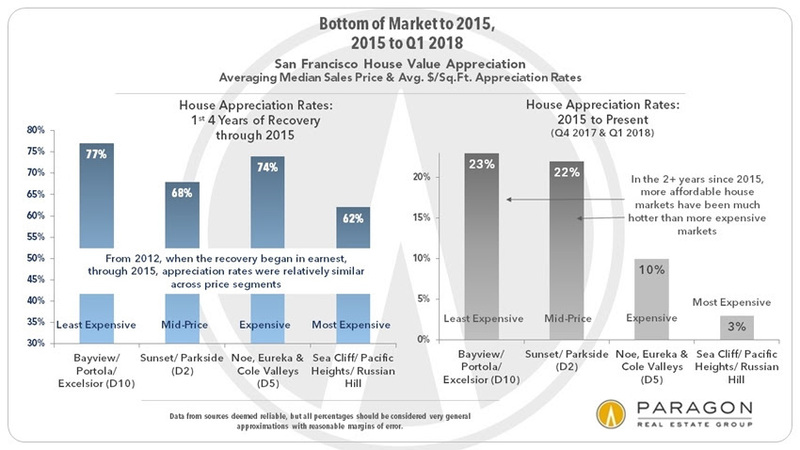 Bayview, with the most affordable houses in SF and also worst hit by the 2008-2011 distressed property crisis, has had the highest compound annual appreciation rate since that time, a staggering 18.3%, or a 6-year total rate of 174%. 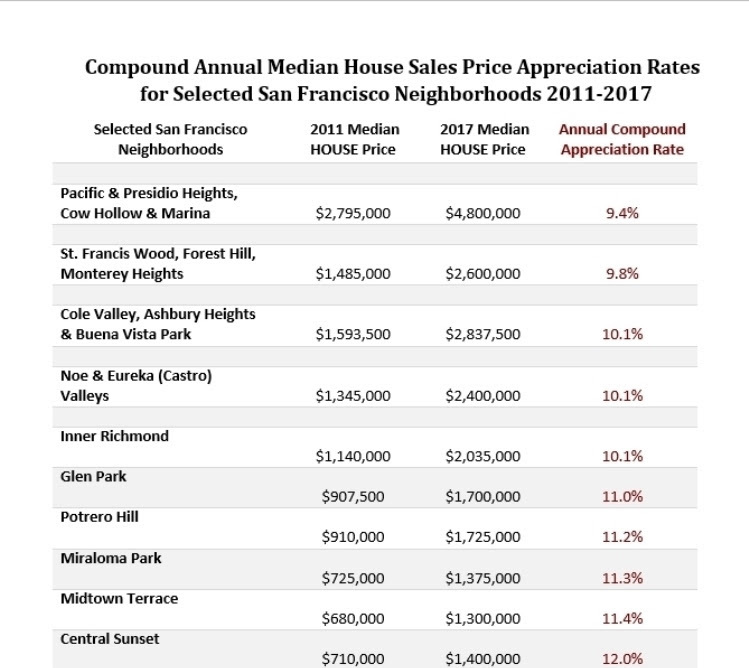 Other affordable neighborhoods running across the southern border of the city – such as Excelsior, Visitacion Valley, Sunnyside, Ingleside and Oceanview – also saw extremely high annual rates of 12% to 14% for similar reasons.The dynamic in the Inner Mission was somewhat different: Its 14.7% compound annual rate of appreciation – a total of 128% over the 6 years – was because it turned into the hottest, hippest district in the city, especially among younger high-tech workers. The gentrification which had been slowly occurring for 30 years suddenly went into overdrive to catapult prices higher. 2015 to PresentThe first 4 years of the recovery which began in 2012 saw high home-price appreciation rates across the city. In 2015, the market shifted – there was considerable financial market volatility in late 2015 and the first half of 2016, a precipitous drop in IPO activity, and the high-tech boom cooled temporarily – and appreciation rates diverged, with less expensive homes significantly outpacing more expensive neighborhoods. One factor was that buyers were desperately searching for homes they could still afford. 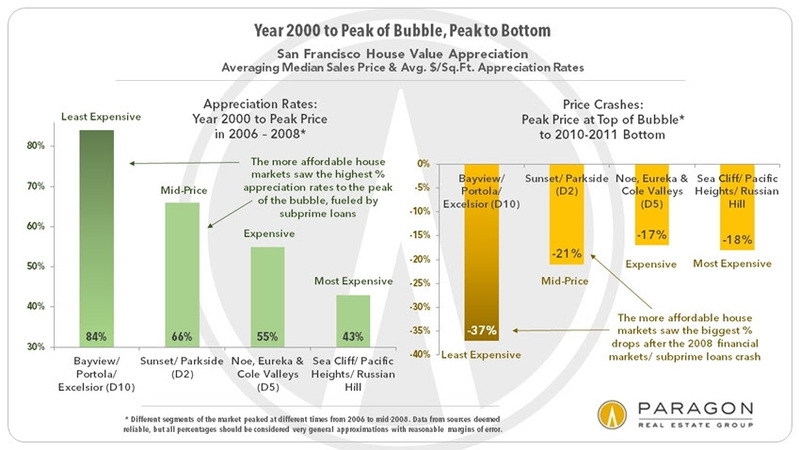 2000 to PresentBy total percentage appreciation since 2000, Sunset/Parkside ranks first. 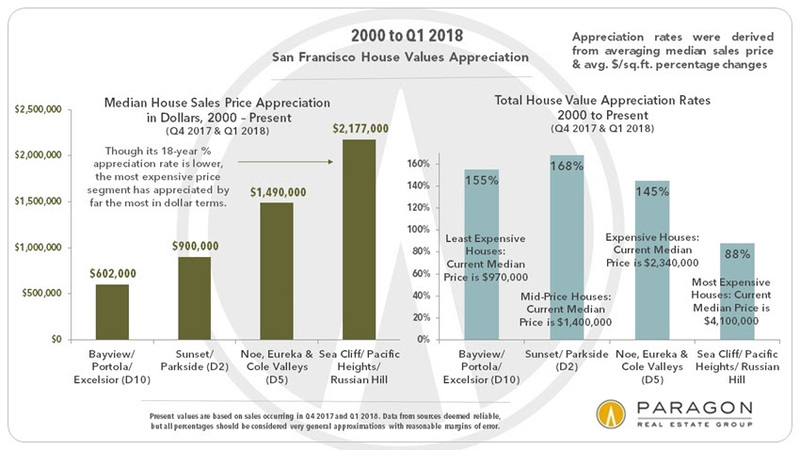 By actual dollar appreciation, the most expensive home prices increased the most, typically by well into seven figures. 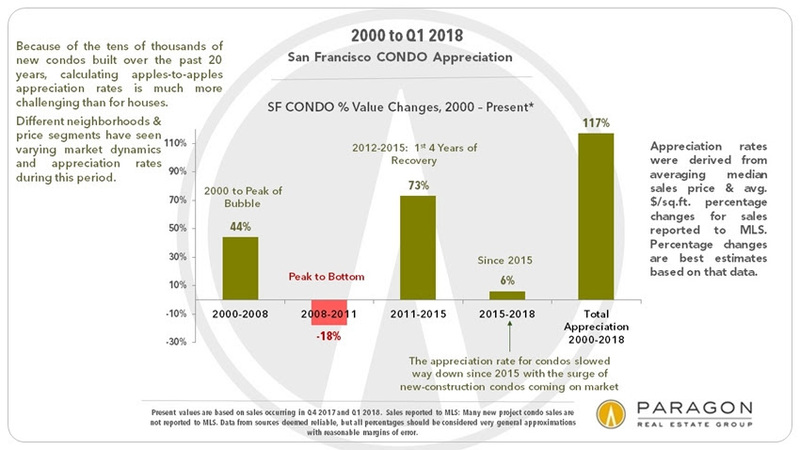 2000 to Present, All DistrictsGenerally speaking, the SF condo market has not seen appreciation rates as high as for houses. 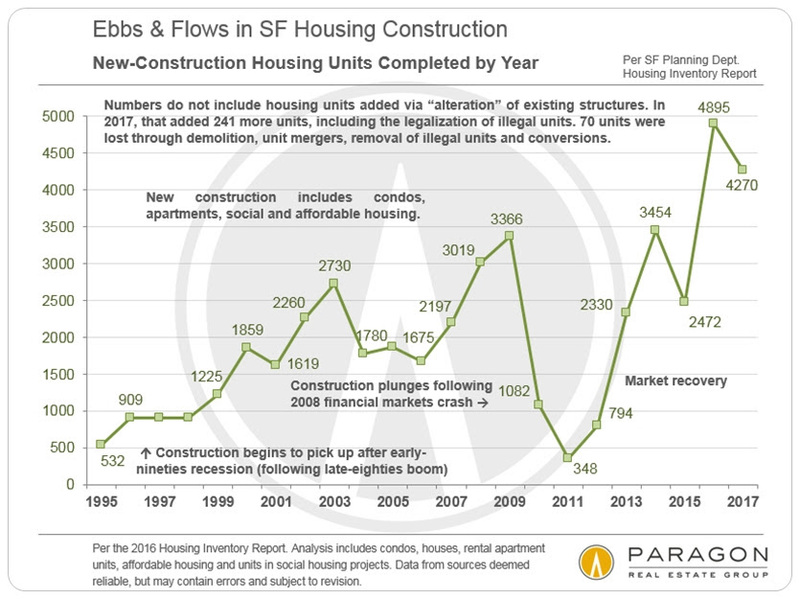 Mostly, this has to do with increasing supply due to the boom in new condo construction, but it was also affected by factors in 2015-2016 already described above.